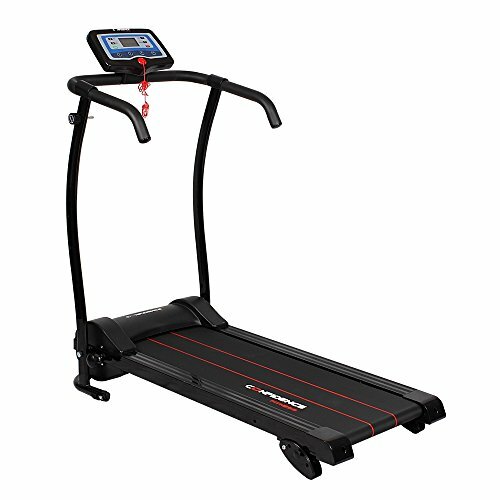 Here for your home workout convenience is the confidence power Trac, a Treadmill designed to be affordable and brimming with features. You can even compact it to a folded position when it's not being used. Confidence has fitted the Treadmill with a 600W motor capable of speeds from 0.6mph to 6.2mph. There are four pre-set speeds and 12 built-in fitness programs to choose from, along with three possible angles of incline to increase to. A stop clip is available for emergencies. Monitoring your fitness is also possible thanks to the informative LED display screen. Keep a close eye on your calories, speed, time, and distance throughout your workout. Features 12 built-in fitness programs range of speeds: 0.6-6.2mph four quick-select pre-set speeds: 1.86mph, 3mph, 4.9mph, 6.2mph LED display shows: speed, distance, time, calories adjustable manual incline: 5 degrees, 3.5 degrees, 2 degrees emergency stop clip 600W motor specifications runway size: 14in x 39in folded arm length: 22 inch dimension when ready for use (L x b x h): 49in x 24in x 47in dimensions when folded up (L x b x h): 49in x 24in x 10in weight of machine: 52lbs weight of delivered package: 55lbs max user weight: 265lbs max load: 330lbs convenient exercise is just a simple order away with the confidence power Trac Treadmill. Manufacturer: Golf Outlets of America, Inc. Publisher: Golf Outlets of America, Inc. Studio: Golf Outlets of America, Inc. If you have any questions about this product by Confidence Fitness, contact us by completing and submitting the form below. If you are looking for a specif part number, please include it with your message.